According to W.D. 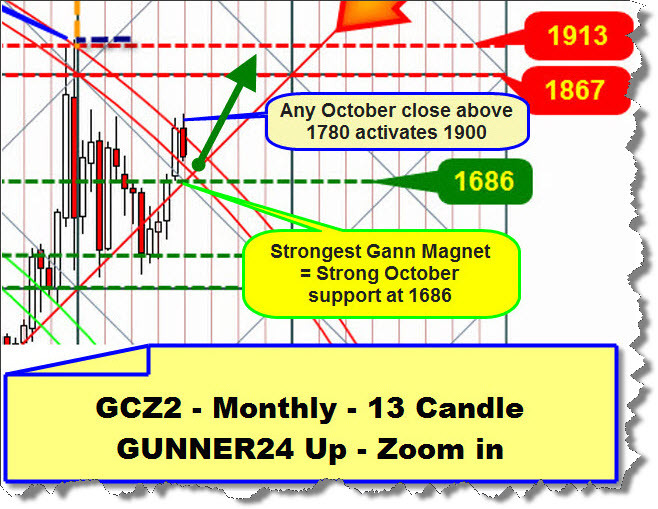 Gann the third and the fourth test of an important angle are the trend-setting ones. If the angle breaks in the third or fourth test there’ll be a change in trend. If a rebound from the angle happens the existing trend will be continued even accelerating, i.e. in this case if the 1*1 resists this time again in the decisive 4th test taking place a visible rebound from the 1*1 next week the uptrend will be newly confirmed even intensifying powerfully and not ending before the main target of this setup, the 3rd double arc is reached (1525 until February… That would correspond to the scenario "Obama wins election"… Another long-lasting upswing until the end of the year would have to be the result – as analyzed above! So, if next week all in all goes on selling off as a matter of fact the "Romney wins election" scenario will be anticipated. Certainly as a result we’ll be allowed to reckon with a stronger recuperation rally after the election but it would be indefinitely difficult to re-conquer permanently the 1*1 angle once it is broken downwards. Such a market is supposed to continue in the bearish half of the setup. That goes with the message that a vote for Romney would point to a rather weak year-end 2012. Let’s go now to the red arrows in the setup above. Supposing that the actual correction happens in a classical ABC-wave-structure maybe last Wednesday being the 13thh day of the correction we saw the final lows of the A-wave. Since then the market is possibly in a B-wave likely to last 5 days that may thoroughly correct a 50% of the last downswing, so it may go up to 1748. Then the C-wave with again 5 days but rather 8 or 13 days of correction might follow. 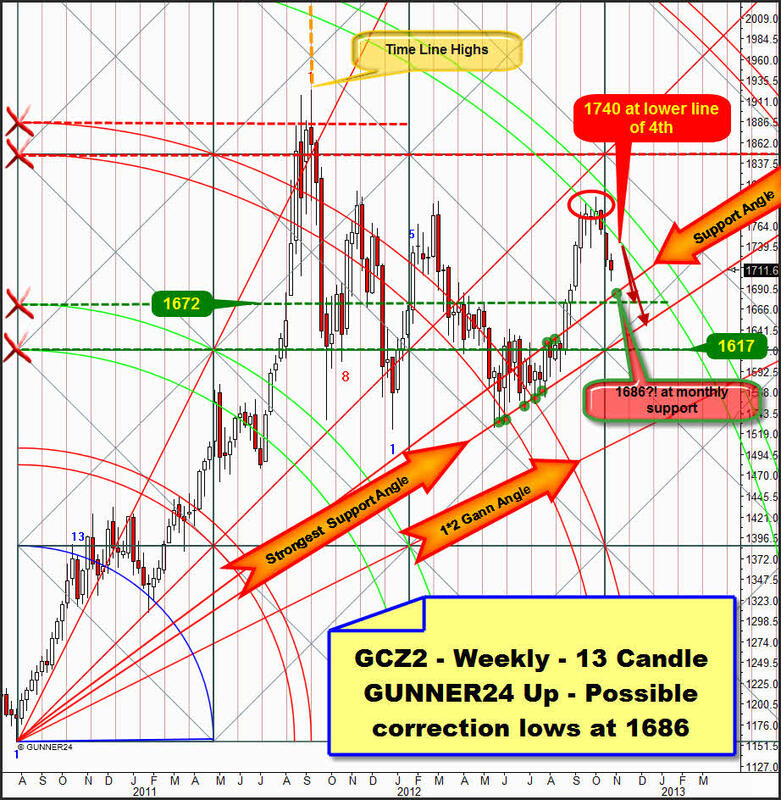 Then there will be the high probability that the 1686 on daily basis won’t resist ending the correction at the 1672 surroundings or even at the "strongest support angle" which would be the 1650 surroundings. At first we see which way the 2011 top was made almost perfectly at the limit in price of the setup. Then there is the performance at the 5th that made silver classically rebound or top respectively. 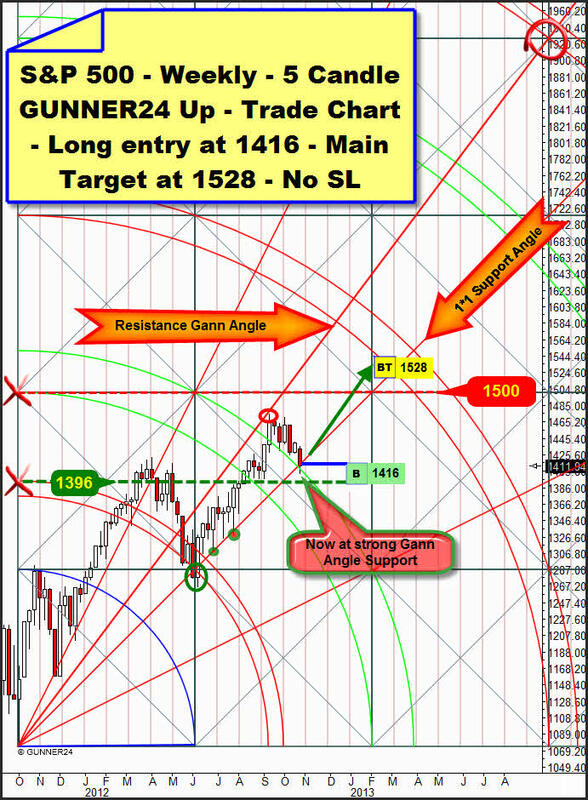 In addition we can make out the "Strongest Support Gann Angle" that was responsible for the formation of the 2012 summer lows. 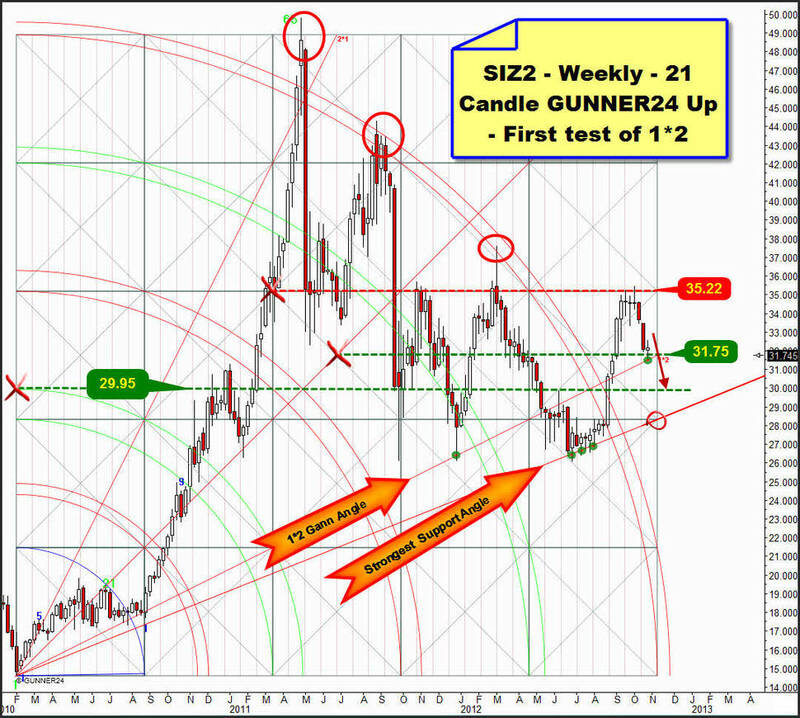 Then the long lasting resistance of the 5th double arc was taken and simultaneously the 1*2 Gann Angle was re-conquered.